The Atlanta Journal-Constitution published an editorial cartoon Sunday that depicts the recent police shooting in Ferguson, Missouri of unarmed 18 year old black robber Michael Brown by white police officer Darren Wilson as that of Atlanta native and civil rights icon Rev. Martin Luther King, Jr. being shot by a white policeman. 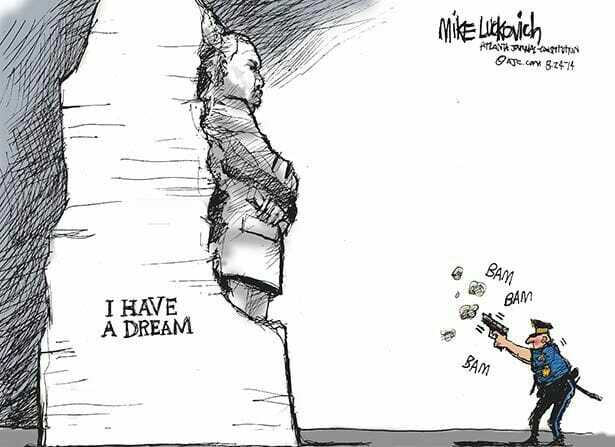 Standing in front of the statue of King is a white police office in a firing stance with his gun aimed at King. Smoke clouds and the words “BAM, BAM, BAM” are shown around the gun to make the point the officer is unloading his weapon on King. The editorial cartoon, by Mike Luckovich, is captioned, “Threat response.” Luckovich was awarded the Pulitzer Prize for editorial cartooning in 1995 and 2006. In real life, King was assassinated by a white racist, James Earl Ray–not a policeman–on April 4, 1968 in Memphis, Tennessee. King preached non-violence to achieve the goals of the Civil Rights Movement in the United States during the 1950s and 1960s. King was awarded the Nobel Peace Prize in 1964. Brown was not a non-violent young man. Videotape taken minutes before his death show him manhandling a store manager who tried to stop Brown from stealing about $48 worth of cigarellos. After being told by Officer Wilson to move out of the street, Brown reportedly attacked Officer Wilson with such force that Officer Wilson’s eye socket was broken according to what three sources told The Gateway Pundit. The extent of Officer Wilson’s injuries are disputed, but Ferguson police say that Officer Wilson’s face was swollen after being beaten by Brown. There are contradictory reports about whether Officer Wilson knew Brown was wanted for the recent robbery, but Brown knew. Officer Wilson shot Brown with six bullets following Brown’s attack. Accounts also differ as to whether Brown was in the act of surrendering to Officer Wilson or charging him when he was shot and killed. Investigations by local and federal authorities in to the shooting are ongoing. The Atlanta Journal-Constitution has rendered its judgment.